Kyung-Sook Shin is the author of numerous works of fiction and is one of South Korea’s most widely read and acclaimed novelists. She was the first woman to be awarded the Man Asian Literary Prize (for Please Look After Mom), and she has also been honored with the Manhae Literature Prize, the Dong-in Literature Prize, and the Yi Sang Literary Prize, as well as France’s Prix de l’Inaperçu. Please Look After Mom is her first book to appear in English. It will be published in twenty-nine countries and has sold over 2 million copies in South Korea alone. While second-person (“you”) narration is an uncommon mode, it is used throughout the novel’s first section (the tale of the daughter, Chi-hon) and third section (the tale of the husband). What is the effect of this choice? How does it reflect these characters’ feelings about Mom? Why do you think Mom is the only character who tells her story in the first person? What do we learn about the relationship between Chi-hon and her mother? What are the particular sources of tension or resentment between them? Why does Chi-hon say to her brother, “Maybe I’m being punished . . .” (p. 68)? Why is it significant that Chi-hon is a successful writer, and how does her career affect her position in the family? What does this mean for her relationship to her mother, who is illiterate? How does it happen that her mother begins to treat Chi-hon like “a guest” when she visits home (p. 17)? Mom’s life has been defined by her relationships to others and the needs of her family. When her daughter asks her, “Did you like to cook?” how does Mom’s reply summarize the divide between her own and her daughter’s generations (p. 57)? How is the generational gap between you and your parents, and/or you and your children, at all similar to, or different from, this one? What are some of the reasons for the special bond between the eldest son, Hyong-chol, and his mother? Why does Hyong-chol feel that he has disappointed his mother? Why does she apologize to him when she brings Chi-hon to live with him (p. 89)? Why do you think he hasn’t achieved his goals (p. 112)? Why is food such a powerful element in Hyong-chol’s memories of his mother? How do you explain the fact that Mom has been seen by various people wearing blue plastic sandals, with her foot badly injured, although when she disappeared she was wearing low-heeled beige sandals (pp. 64, 72, 73, 90, 91)? What do you make of the pharmacist’s story of treating her wounded foot and calling the police (pp. 99–101)? Does Mom’s own narrative solve this mystery? The Full Moon Harvest is a festival in which Koreans traditionally return to their family home to honor their ancestors. Hyong-chol reflects that people are now beginning to take holidays out of the country instead, saying, “Ancestors, I’ll be back” (p. 92). What feelings do memories of their mother’s preparations for the festival stir up in Chi-hon, Hyong-chol, and their father (pp. 92–98)? Weeks after his wife disappears, her husband discovers that for ten years she has been giving a substantial amount of money—money their children send her each month—to an orphanage where she has taken on many responsibilities (pp. 116–21). How does the husband react to this and other surprising discoveries about her life? After Mom has gone missing, her husband says to himself, “Your wife, whom you’d forgotten about for fifty years, was present in your heart” (p. 122). Discuss the pain and regret Mom’s family feels, including in the context of the book’s epigraph from Franz Liszt, “O love, as long as you can love.” Have they followed this edict successfully? Why do you think Kyung-sook Shin chose this quote to open her story? Taking out the burial shrouds his wife had made for the two of them, her husband remembers her wish that he die first: “Since you’re three years older than me, you should leave three years earlier” (p. 135). What is the effect of the way this passage moves from poignancy to humor and back again? Similarly, how do grief and warmth, even happiness, intertwine as he recalls his wife’s generosity and her hands applying a warm towel to his arthritic knee (p. 140)? Do you think Mom’s husband and children would have been able to help her if they had paid her and her illness more attention? Or, given her aversion to the hospital and the way she hid her sickness, was what happens to her inevitable? Discuss the return of Mom as storyteller and narrator in the fourth section. What is inventive about this choice on the author’s part? What surprised you—and what remained a mystery? How does Mom’s feeling for her younger daughter differ from her feeling for Chi-hon? Why was she able to be more attached to the younger daughter than the elder one (pp. 180-85)? How is the use of the second person here—Mom addressing her daughter as “you”—different from the use of second person in chapters 1 and 3? What do her children and husband discover about Mom’s life only after she disappears? How do her actions express her generosity and benevolence? Do you see some of her activities as ways of seeking self-fulfillment? Was she, through giving to others, taking care of herself? What are we to understand of the fact of Mom’s possibly being spotted, in chapter 2 (“I’m Sorry, Hyong-chol”), in the various neighborhoods where Hyong-chol has lived in Seoul? In Mom’s own narrative (chapter 4, “Another Woman”), what is the connection between herself and the bird her daughter sees “sitting on the quince tree” (p. 175; see also p. 170). At the end of the father’s section, he says to his older daughter, “Please . 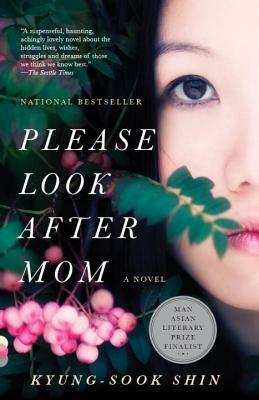 . . please look after your mom” (p. 164). How does Chi-hon carry out this directive? How is it related to her feelings about the Pietà and her purchase of “rose rosary beads” at the Vatican (pp. 234–37)?